Providing you the best range of gugal 100 gm loose scented agarbatti and loban 100 gm loose scented agarbatti with effective & timely delivery. 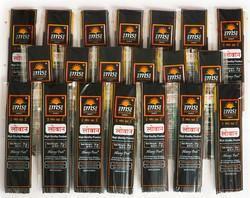 We are engaged in offering a wide array of gugal Aromatic Incense Sticks. 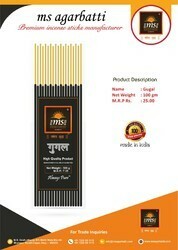 Our offered agarbatti is highly acclaimed in the market for its pleasing fragrance that provides mind peace. These products are used at the time of worshiping in homes, restaurants and many other such areas. Under the guidance of our adept professionals, the provided agarbatti is processed using quality approved natural herbs with the help of advanced machinery. Available in diverse packaging options to meet the varied requirements of our patrons, this agarbatti is available at an economical price. 5.long range with strong smell . 9.zero defected Home made raw sticks .